Russians seem to have added watching of these Soviet films to a number of must-do rituals on New Year’s Eve, such as drinking champagne when the Kremlin clock strikes midnight. It’s more than two decades since the collapse of the Soviet Union in 1991. The new, democratic Russia has changed beyond recognition over these past years. While most of the Russians may take an extremely negative view of their life in the former Soviet Union, almost all still suffer from irrevocable nostalgia for some Soviet films that are invariably shown on Russian TV channels on New Year’s Eve. Their love for these Soviet films has not changed with the passage of time. 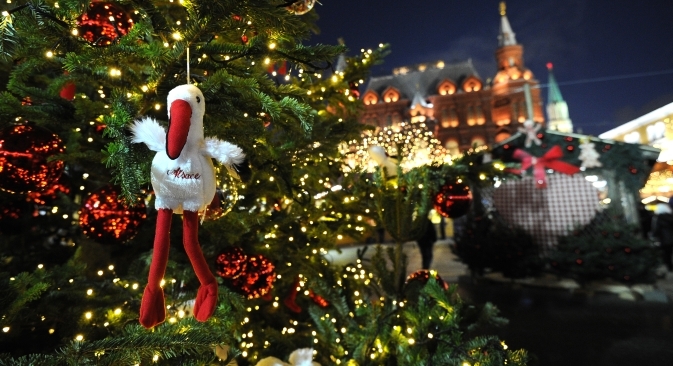 Even today, Russian TV channels compete to get the right to show them on New Year’s Eve. Russians seem to have added watching of these Soviet films to a number of must-do rituals on New Year’s Eve, such as drinking champagne when the Kremlin clock strikes midnight, heralding the arrival of the New Year. People in the former Soviet Union started this tradition in 1960’s, when the country started producing its own champagne. Initially the “unspoiled” Soviet people perceived this custom as unnatural. But now everyone has got accustomed to it and moves along even if they would prefer a different type of drink at any other time. Indeed, “The Irony of Fate, or Enjoy Your Bath,” “The Carnival Night,” “Magicians,” “Gentlemen of Fortune” and “Moscow Doesn’t Believe in Tears” are the most popular Soviet films which have become sort of a ritual for Russians for decades as the New Year’s fir tree and festive table with “salat olivier” and champagne. With a perception now free from the influence of Communist ideology, Russians just watch and enjoy these films, while wondering what life was like in the Soviet Union. It is a mystery how the tradition of watching the movie “The Irony of Fate, or Enjoy Your Bath” on New Year’s Eve started in the Soviet Union. It was produced by famous film director Eldar Ryazanov in 1975. Because of its dominating drinking theme, the film barely escaped a ban by the Soviet government. Former Soviet President Mikhail Gorbachev tried to ban the film as part of his anti-alcohol campaign when he came to power in 1985. However, the government later changed its mind and allowed it to be screened without the drinking scene in the sauna. The film opens with a prelude saying that such a story could only have taken place on New Year's Eve. The script plays on the similarity of houses in Soviet times. Many people across the country lived in almost identical apartment buildings. In the movie, an inebriated surgeon Zhenya (Andrei Myagkov) in Moscow and a girl Nadya (Barbara Brylska) in St. Petersburg (Leningrad, in Soviet Union) live in lookalike flats. To add to the confusion, they both have the same address, albeit in different cities of Moscow and the-then Leningrad. The action starts with four Moscow friends in a “banya” (Russian sauna) - something they always do on December 31. When everyone is drunk, Zhenya goes to Leningrad by mistake. The confusion that follows is the beginning of a love story. Zhenya finds himself in a flat similar to his own surrounded by his own furniture and with his own New Year tree. Until the real owner of the flat, Nadya returns home to find to her utter amazement a half-naked tipsy man in her bed. Nadya finally succeeds in convincing her guest that although he is at the correct address he is in the wrong city. In comparison to “The Irony of Fate, or Enjoy Your Bath,” “The Carnival Night” is a 1956 Soviet musical film, the first big-screen film of the great Russian film director Eldar Ryazanov. The main role in this film made Lyudmila Gurchenko one of the most well-known actresses on the Soviet scene. “The Carnival Night” is another famous Soviet-era blockbuster that Russians associate with New Year, simply because it was this 1956 comedy that actually commenced the tradition of New Year's movie-watching in Russia. It was the first comedy free of propaganda. The film became the Soviet box office hit in 1956 with a total of 48.64 million tickets sold. The film starts with New Year’s Eve fast approaching and the workers of the Economics Institute prepare for the New Year’s Eve with a big night entertainment program, which includes a lot of funny performances, singing and dancing. Just as it is happening, suddenly it is announced that a new director Comrade Ogurtsov (Igor Ilyinsky) has arrived and he disapproves of the big night program. The new director wants to make it more serious, something with annual reports and long speeches to show the Institute's progress over the year, and, perhaps, a bit of serious music, something from the Classics, played by the Veterans' Orchestra. Obviously, no one wants to change the program a few hours before the show, much less to replace it with something so boring! Obviously, nobody agree with his plans and the fight for the happy New Year is started. Now everyone has to team up in order to prevent Ogurtsov from getting on to the stage. As some of them trap Ogurtsov one way or another, others perform their scheduled pieces and celebrate New Year's Eve. Another Soviet film “Magicians” made in 1982 also became a classic Soviet New Year’s Eve romantic comedy. Directed by Konstantin Bromberg, it is loosely based on the science fiction novel “Monday Begins on Saturday” by Boris and Arkady Strugatsky. “Gentlemen of Fortune” a comedy released in the end of 1971, is one of the most successful Soviet movies starring some of the famous Soviet actors at the time. In terms of ticket sales, it became the number one film in 1972, in the Soviet Union. It was watched by 65 million viewers. The film combines adventure, comedy, crime and parody to make a family friendly entertainment without having any violent, sexual or other objectionable scenes for the audience. But unlike “The Irony of Fate, or Enjoy Your Bath,” the Soviet blockbuster “Moscow Doesn't Believe in Tears” has nothing to do with New Year's Eve. But its fairy-tale theme with a feminist angle and the passion it generates in audiences justifies its screening every New Year’s Eve. A bitter-sweet comedy about three women who came to Moscow during the 1950’s to seek work and love, won film director Vladimir Menshov an Oscar in 1980 and the popularity of millions of viewers throughout the Soviet Union. The film won an Academy Award for Best Foreign Language Film in 1980. Besides a melodramatic plot, the film is memorable for its portrayal of Moscow in the 1950’s, when unknown poets read their poems in public. Even though people who have watched it umpteen times, every time on the New Year’s Eve, they prefer to see it. There is something in the film that makes them to sit near the television and watch the film.